I made a single blossom boutonniere for brother, double blossom boutonnieres for my husband and father, and a triple blossom corsage for my mom. 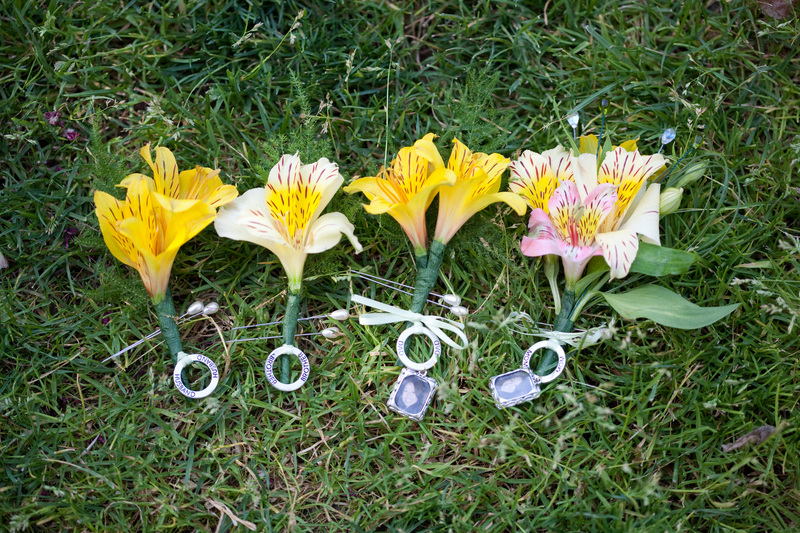 I also made them in this order, so I could save my mom’s corsage, the most complicated project, for last. 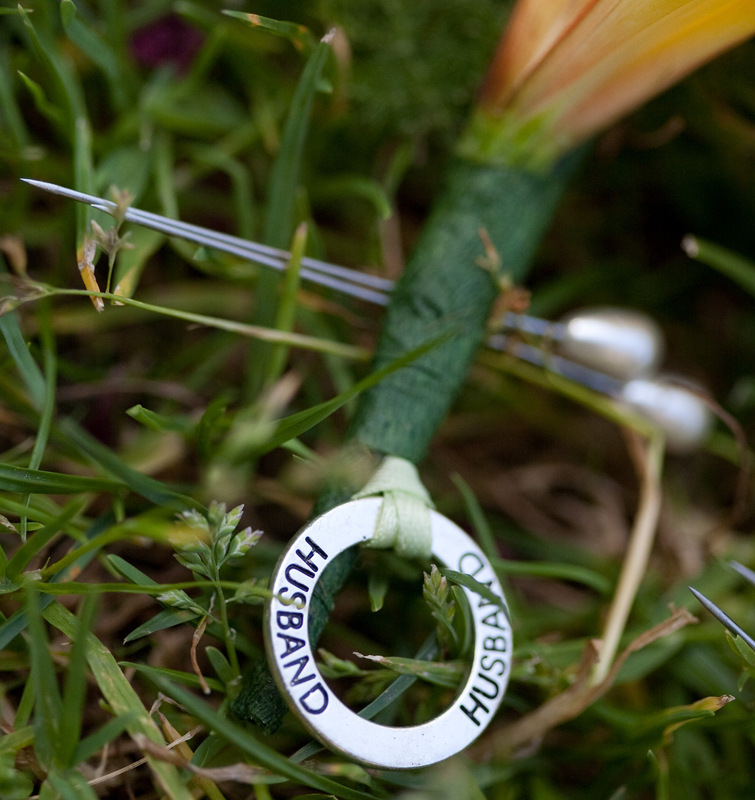 Aside from the blossoms, a basic boutonniere requires the following: floral tape, floral wire (26 gauge), and corsage pins. To add a personal touch, I also utilized family title charms, small photo frame charms, and a couple of decorative beads on wire. 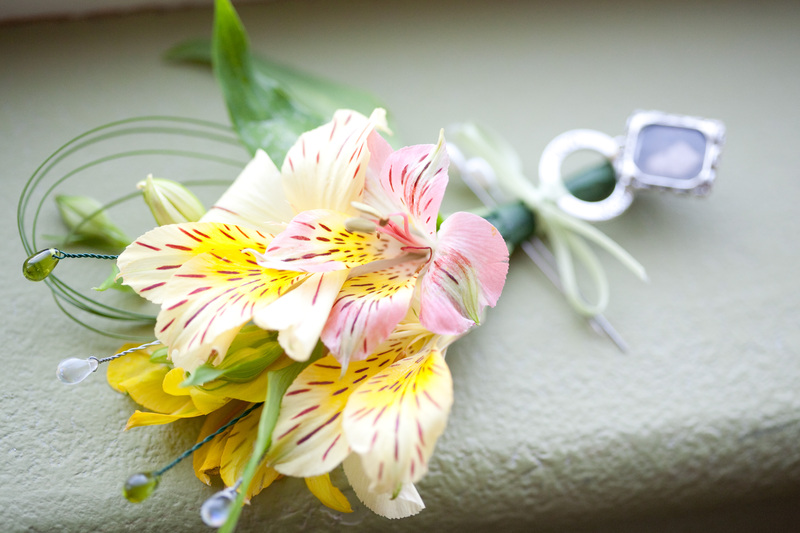 The family title charms were a happy accident–I came across them in the jewelry supply aisle of my local Michaels Arts and Crafts store, and thought they would be a perfect little addition to the bouts/corsage. I also included a small framed photo of myself for my parents’ flowers to give them a little something extra. 1. Prep your blossoms. Cut away excess foliage, and using a sharp knife cut the stem so it is about 2″ long. 2. Cut a 5″ piece of 26 gauge floral wire. 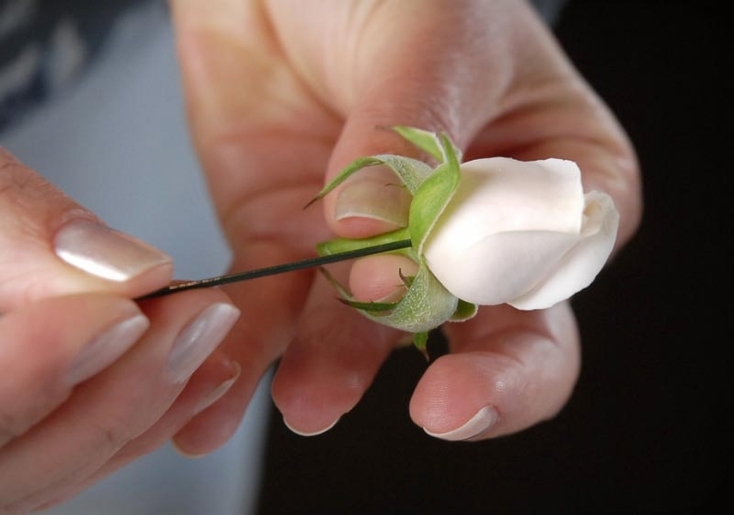 Use it to (1) pierce the base of the blossom, and (2) pull the wire through halfway. 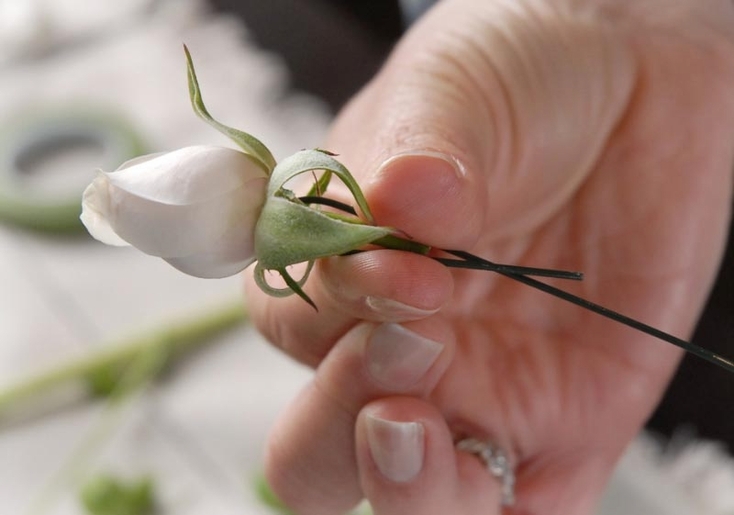 Then (3) carefully fold each side down along the stem, and trim the excess that is longer than your stem. Think of this as “scaffolding”–it provides a little extra support for the stem since it’ll get handled a bit as the bout/corsage gets pinned/unpinned. This website provides great guidance for this process: step 1, step 2, step 3. 3. Wrap floral tape along the length of the stem, starting from the base of the blossom and with some tension to help the tape stay secure around the stem and wire (you need to pull the tape a bit to make it tacky). 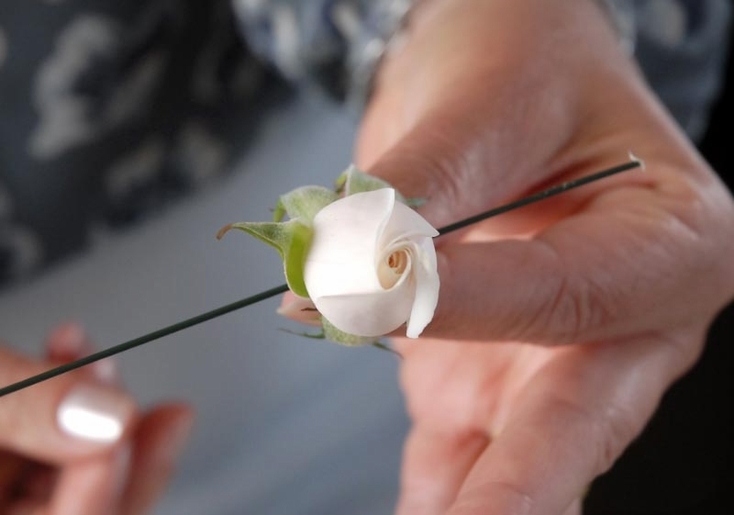 Do this for each blossom for the boutonniere. 4. At this point, I added the family charm. Since it was a circle, I looped a small piece of thin ribbon, and then held it against the stem(s). Then I used more floral tape to secure it and the blossom(s) together. 5. 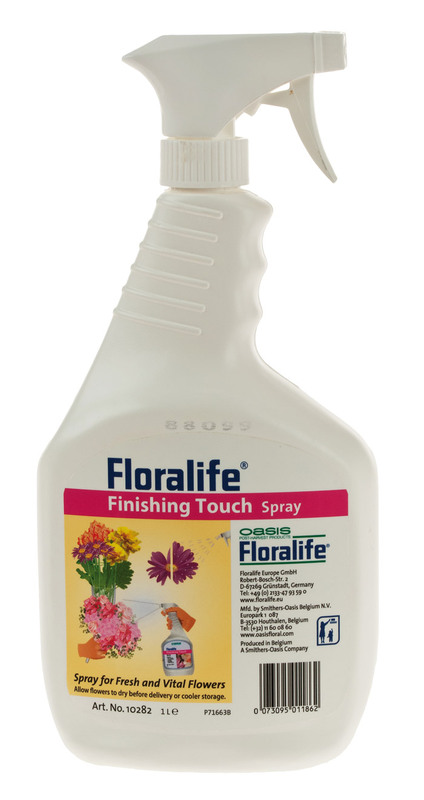 Lastly, I used floral finishing spray, which I highly recommend. Far better than mere water, this spray keeps your flowers looking fresh and well-preserved, so you can make your bouts the day before the big day. This frees up valuable time so you can tackle other DIY projects! Store in a cool place (mine were fine in the fridge overnight). For my mother’s corsage, I used three blossoms, and also added some greenery, a few strands of bear grass, and some decorative beads. If you decide to go this route, I wish you the best of luck. Once you get the hang of it. it’s a great sense of accomplishment!